Formed by the confluence of the mighty rivers – the Ganges, the Brahmaputra and the Meghna – the Sunderbans are a part of the world's largest delta situated on the lower end of the Gangetic West Bengal. It is also the world’s largest estuarine forest crisscrossed by hundreds of creeks and tributaries, intersected by a network of tidal waterways, small islands of salt-tolerant mangrove forests and mudflats. The interconnected network of waterways makes almost every nook and corner of the forest accessible by boats or rafts making it one of the most attractive and alluring places on earth and an undiscovered paradise. The Sunderban cruise through the Sundarbans National Park is one of the most memorable experiences of a lifetime. Such is its beauty that it was among the top 10 finalist of the "new7wonders of the world". The physiography of the Sundarbans is dominated by a vast and remote land mass, criss crossed with rivers, creeks and tidal channels. Road network and human habitation ends at North and North West fringe of the mangrove forest and further entry into the forest is only via water through boats. The temperature in Sunderbans. The soil of the Sundarbans is prone to high tide and low tide twice in a day and the salinity of the Indian part of Sunderbans i is higher that its Bangaledesh counterpart. Sundarbans has a wide vaiety of flora and fauna. There are 334 plant species belonging to 245 genera and 75 families, 165 algae and 13 orchid species. All these have the capacity to withstand estuarine conditions and saline inundation on account of tidal effects. The most common species are : Hatal (Phoenix paludosa), Genwa (Excoecaria agallocha), Dhundul (Xylocarpus granatum), Kankra (Bruguirea gymnorrhiza), Champa(Bruguiera parviflora), Dhani ghas (Porteresia coarctata), Garjan (Rhizophora apiculata), Keora (Sonneratia apelata), Sundari tree (Heritiera fomes), Golpati(Nypa frutcans). Sundarbans is also rich in fauna with 693 species of wildlife, which includes mammals, reptiles, amphibians, white fishes, shrimps, crabs etc. Banks of these rivers are favorite spot for the fauna of the region and one can easily spot animals It is always advisable to visit these places either during sunset or during sunrise. Tiger, Fishing Cat, Chital, Wild Boar, Water Monitor, Estuarine Crocodiles are found here. Sundarbans, the land of boundless beauty and magnificent landscapes named after the ubiquitousSundari trees which were found there in large numbers, is the largest single block of tidal halophytic mangrove forest in the world and has the honor of being a UNESCO World Heritage Site & a Biosphere Reserve. The Sundarban forest covers around 10,000 sq.km of which a major portion is in Bangladesh, while the Indian portion is estimated at around 4264 square km. The Sundarbans National Park still remains an enigma for all nature lovers who want to visit it at least once in their life time. Amitav Ghosh's "The Hungry Tide" has given it a new perspective and beckons one to visit the forests at least once. Apart from being a unique largest mangrove ecosystem of the world, the Sundarbans has the world’s largest deltaic mangrove forests and is also home to one of India’s most iconic wildlife species – the Royal Bengal Tiger. The area of Sundarban National Park (1330 sq km) and the three watchtowers mainly Sajnekhali, Sudhanyakhali and Dobanki are most commonly visited by the tourists. Sundarbans has its universal appeal as it is a habitat for globally endangered species including the Royal Bengal Tiger, Irawadi Dolphins, estuarine crocodiles, marine turtles, species of shark and ray and the critically endangered endemic river terrapin (Batagur Baska). Cruise through the world’s largest mangrove forest, the Sundarbans, in a Houseboat for a “never before experience”!!! 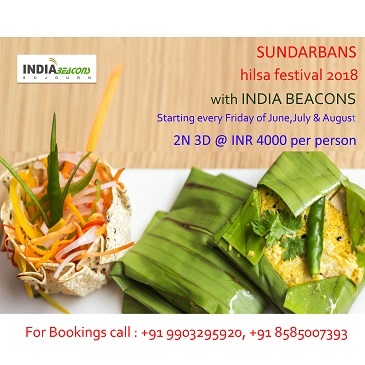 Explore Sunderbans, the land of boundless beauty and magnificent landscapes, on our ethnic houseboat – “M B India Beacons” ….. The cruise through the narrow creeks and canals offers you a glimpse of the unique Sundarbans flora, fauna and wildlife including the famous Royal Bengal Tiger which you may chance upon……. Enjoy the darkness of the night under the starry sky on board our houseboat M.B India Beacons while being anchored in the middle of the river for an experience that is enthralling, adventurous and mystical at the same time……. Our houseboat, M B India Beacons, is a two room ethnic houseboat with a touch of rustic Bengal. The decor of the houseboat has been tastefully designed keeping in mind the rich cultural heritage of Bengal. We strive to offer the best of hospitality and service to our esteemed guests for an experience which will linger upon in their memory. We understand, not all can join the Fixed Day Departure. Hence we arrange for Sunderban Private Tour (Any Day Tour) Packages keeping in mind the specific requirements of the guests and the time frame they have in hand. In case you find it difficult to adjust to or join our fixed day departure tours, you can always call us for a Sundarban Private Day tour or a Sunderban 1N 2D Private tour. 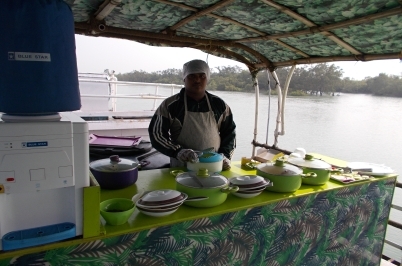 Our Sunderbans Private Day Tours can be arranged throughout the year to cater to the needs of all our guests. Sundarban Private Tours can be customized according to the convenience of the guest and can be customized. Sundarbans Day Tour are conducted all throughout the year. The tour starts at 08:00 hrs from Godkhali and ends at 14;00 hrs. M B India Beacons, is a two room ethnic houseboat with a touch of rustic Bengal. The decor of the houseboat has been tastefully designed keeping in mind the rich cultural heritage of Bengal. 2N 3D Sundarban Package Tour is the most common and preferred tour as it offers a good coverage of the World's largest mangrove forest. 3N 4D Sundarbans Package Tour is the not so popular, however, it gives a comprehensive coverage of the forest.